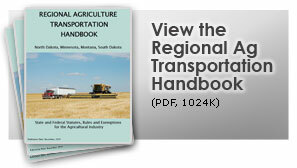 The handbook covers the state and federal statutes, rules and exemptions for the agricultural industry. This document was developed under sponsorship of the Federal Highway Administration, in cooperation with Minnesota State Patrol, Montana Highway Patrol, North Dakota Highway Patrol, and South Dakota Highway Patrol. Thanks are also extended to Minnesota Farm Bureau Foundation for their contributions.